Collegiate beach volleyball is exploding, so much so it’s the fastest growing sport in the history of college athletics! The NCAA is now offering Division I and II beach volleyball teams, and will introduce Division III during the spring of 2016. This opens the door of possibilities to many youth beach volleyball players, since aspiring players will now have many more opportunities ahead of them. Playing collegiate sports is an excellent opportunity for any athlete, so if playing in college is your dream, do not let anything hold you back. It is important to not let any recruiting roadblocks from discouraging you or have it hold you back from going for your dream. Being recruited can be a difficult process, but playing hard and doing your homework is key in creating a successful recruiting game plan. In order to help you out with the process, check out these beach volleyball college recruiting tips that will help you make the most of your recruitment opportunities. Getting a head start by doing your research and reaching out to the coaches early never hurts. In fact, the earlier you start, the more time you will have to brainstorm and that can help you figure out what it is that you really want. Being proactive will help you get the most out of your opportunities. Unfortunately, due to the “newness” of the sport, getting exposure can be more difficult to achieve than with indoor volleyball. With indoor volleyball you can easily get exposure by attending large National and Qualifier events, but you have to be a bit more proactive and creative when it comes to beach recruiting. Make sure you do your research and ask around, you never know what connections you can make unless you put yourself out there and talk to people. Be sure to check out the web, as well as the USA Volleyball website, for any future programs or events that will be held. Since beach volleyball programs typically do not have a large budget, having a highlight video is essential if you want exposure. It can be difficult, or even impossible for a coach to see you in person so if you are serious about recruitment you must have this handy. Having a highlight video is an excellent, and creative way to introduce yourself, as it will show off your talent to a potential coach. Make sure you film yourself playing a game (if possible), as this the best representation of your playing ability. Edit the video so that that any downtime is removed, and make sure it showcases all of your skills in a video that is about 5-7 minutes long. Having all your pertinent information in one place is convenient and helpful to every potential college coach. Having a player profile provides the important information that is needed to the coach, such as your contact information, academic information, recommendations, as well as statistics. In addition, there are websites that will allow you to create a player profile, so all you need to give a potential coach is your profile number and the coach can look you up quickly on the internet. These websites can also feature your video submissions as well! This is an excellent way to get recruited by a college team. 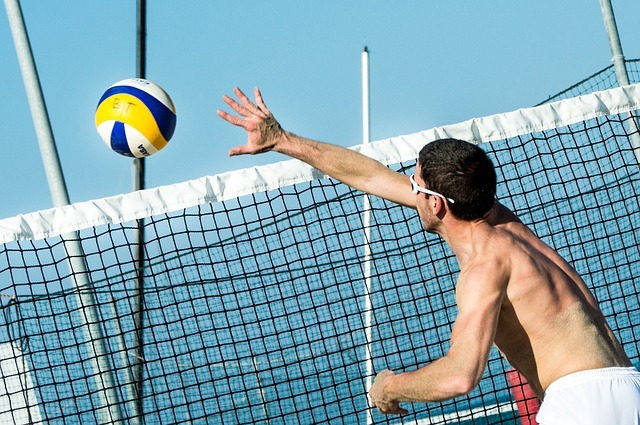 By attending a college or a club beach volleyball camp, you will be exposed to the coaches, the college team, as well as to the athletic staff. This is an excellent way to get a feel for a college that you are considering, especially if you start your search early. When you attend a camp of a potential college pick, make sure you inform the coach of your interest. Just be sure to tell the coach that you are interested in being considered as a potential recruit. In order to find these camps do your research on the internet, or you can also contact the athletic department directly. It is important to remember that while the recruitment process can be difficult, do not get discouraged. With hard work and perseverance you CAN accomplish your goals.